Hi all and thanks for popping in today. 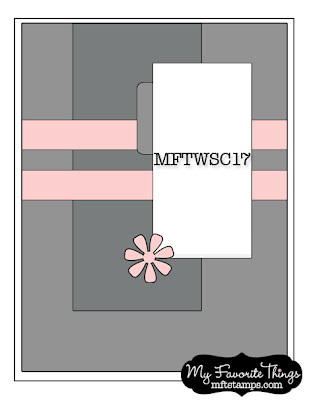 I have a card using MFT Wednesday Stamp Club sketch #17. I used the super adorable, Being Cute is What I Do Pure Innocence stamp set. I don't think I'll ever tire of this set. It's just SO DARN CUTE! 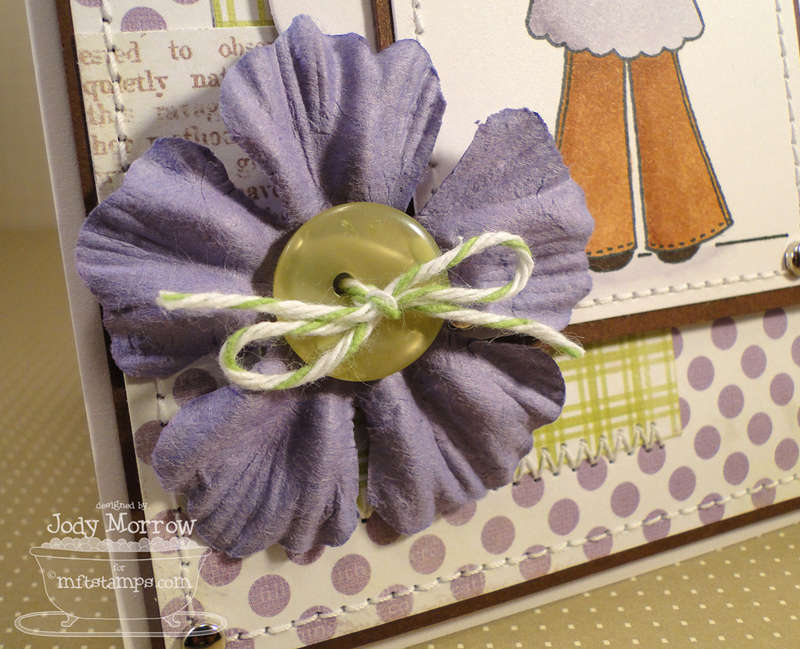 I used a matchy matchy Prima flower from my stash and threaded a green button with some green twine through the middle of it. 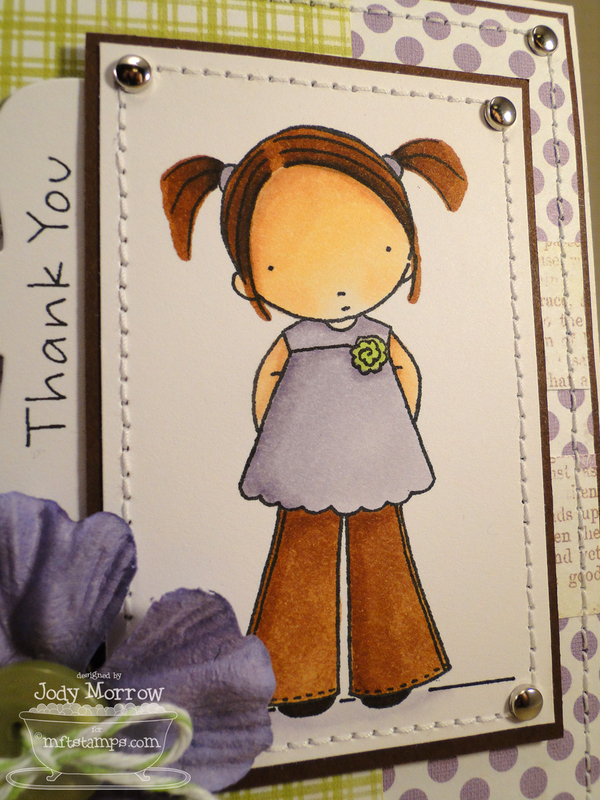 I stamped a thank you sentiment from another PI set (that I forgot to note, sorry). I added it to a Four Point Frame die-cut and added it as a little sentiment tab. 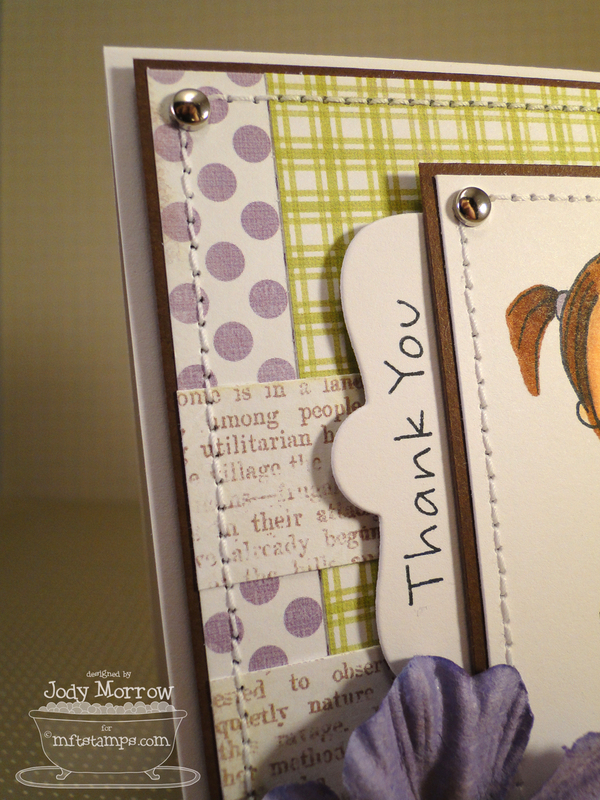 I used Lily Bee Design Picket Fence patterned paper. I am so with you!! I ADORE this little set, it was one of my first ones to get! Because according to my hubby being cute is what I do...LOL... OK, back to your card, I so love your coloring and the paper choices...all lovely! I'll never tire of the PI girls! This is so cute! Love the purple! gorgeous! I'm sooo in LOVE with these papers. Love your card! Love the lavendar and green DP. Love the stitching! My favorite card for this sketch! such pretty coloring & papers & that fab flower- i just LOVE it! most excellente!!! :) love the purple!! and what a cute PI!! always!! Really cute! And I love the shaped tab. You know what I need....that paper and more flowers so I can rock a card like this one! Way too cute!